Arboretum is the fifth of my outdoor pieces. It is a slowing unfolding, mainly gentle musical experience. 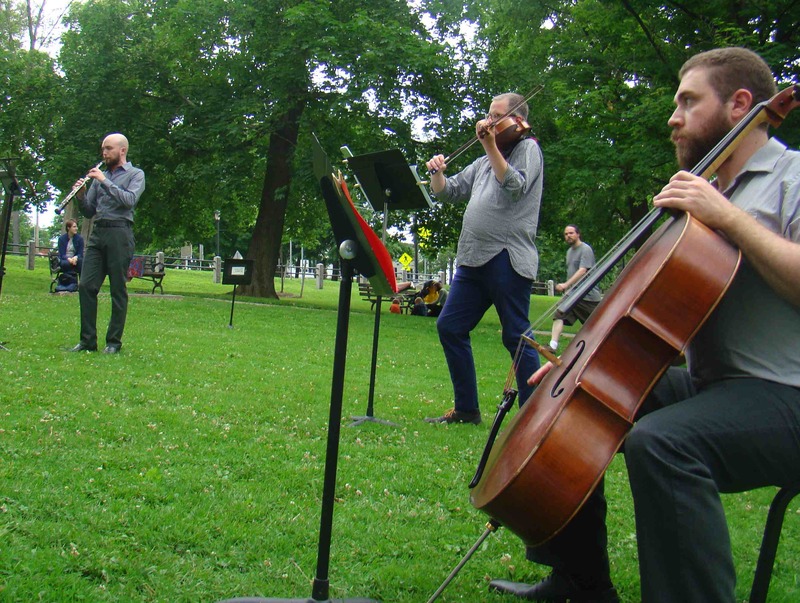 Like the different trees in an arboretum, the music presents 50 different evolving harmonies, each lasting one minute with occasional interludes of mysterious noises or drones. The composition lasts approximately 58 minutes. The audience is invited to wander around the performance space and listen to the music from different perspectives and orientations. 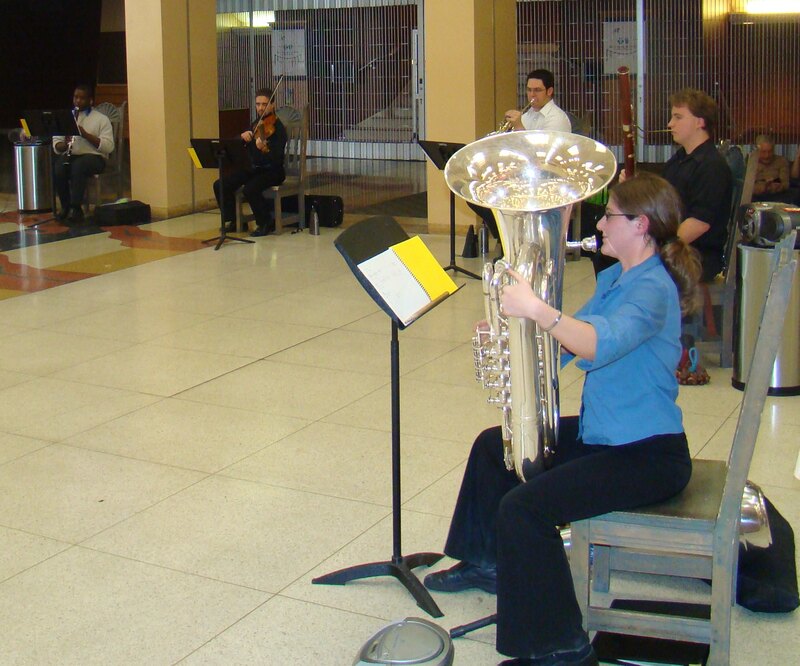 Some may want to sit down and listen to the piece as it slowly evolves, while others may wish to enter and leave the performance from time to time. 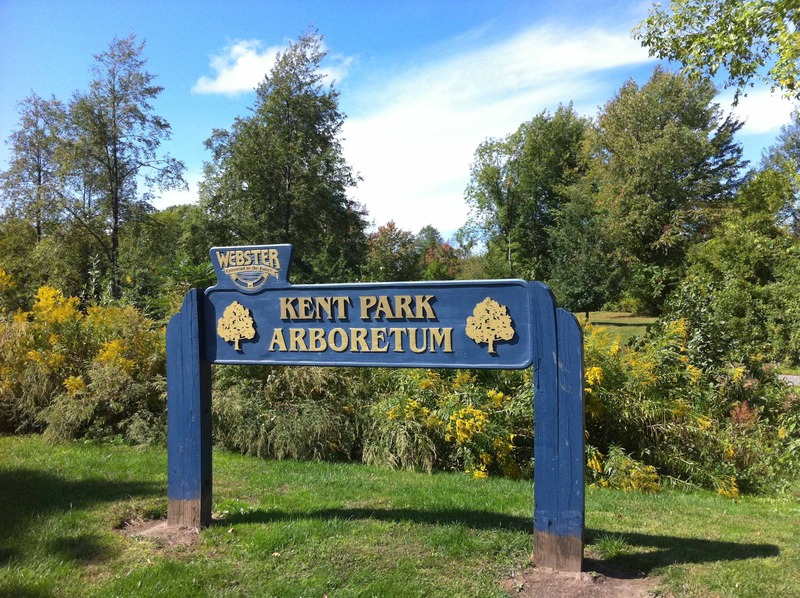 Arboretum is not just concert music played outdoors, even though it is written for musicians who ordinarily play concert music. The music is less formal than concert music and employs special notations to permit various degrees of improvisation. 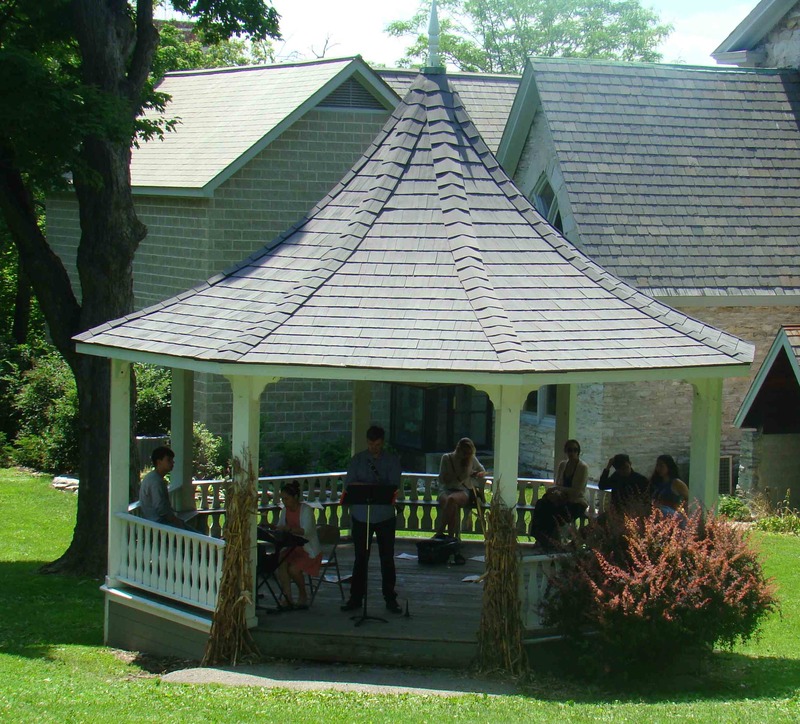 The pacing of the piece is often relaxed, spacious, and sometimes ritualistic, in contrast to the social rhythms of music in most cultural settings. The experience of this music is like watching sunsets, clouds passing, or sea changes. Sometimes there are abrupt changes, like a sudden gust of wind or a startling animal sound. 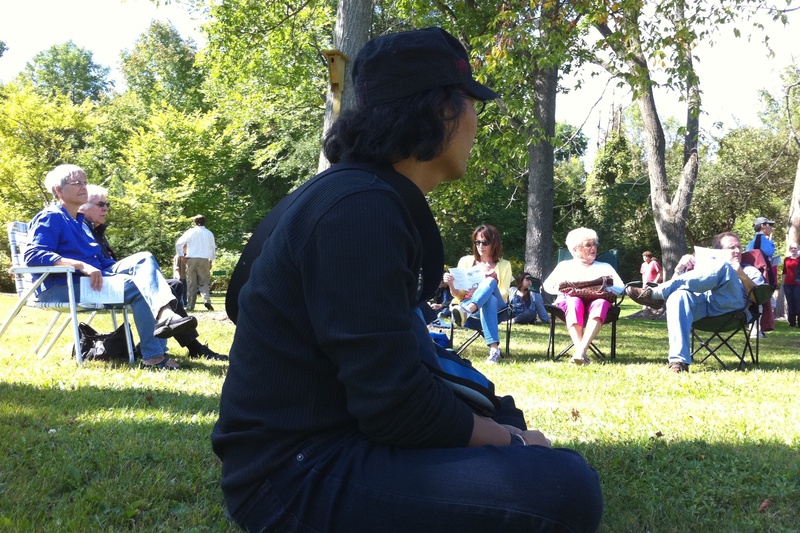 Musical attention is akin to noticing and enjoying the subtle differences among flowers, leaves, plant morphology, birds, animals and insects and their sounds. 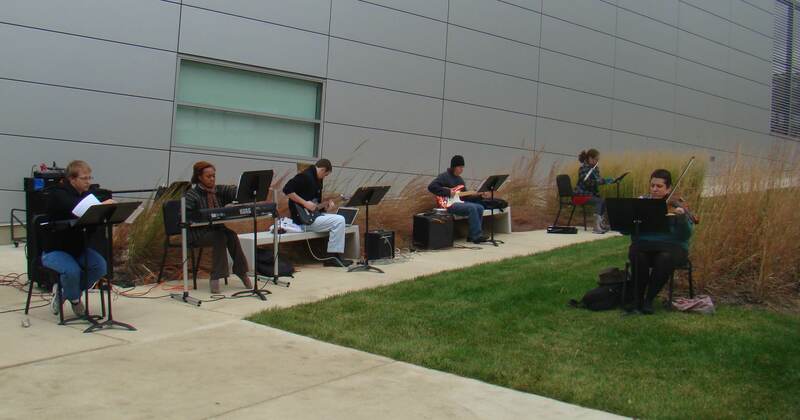 To see some pictures of past performances of Arboretum, scroll down the page. 1. As a computer-sound piece, played from one or more CDs in various ways. In this mode the work may be played outside or within an indoor venue. 2. As an instrumental piece played live but perhaps with tracks from the CD version. 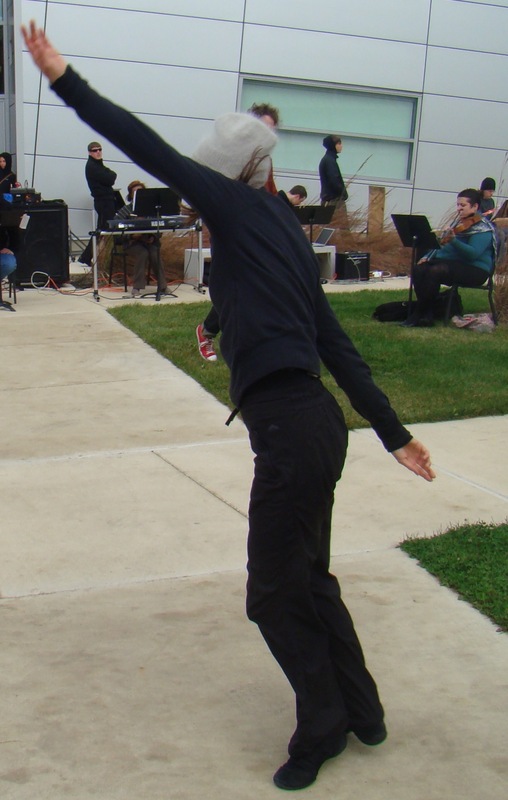 The score and parts are written an a spatial notation similar to those I’ve used in my other outdoor pieces that permits some performer choice and simple forms of improvisation. The piece may be unconducted so that each player uses a timepiece to coordinate his or her part with the rest of the ensemble and/or CDs. This version may employ the short solo instrumental compositions that are part of the work to be played a specified times during the composition. 3. As a concert piece for string ensemble. 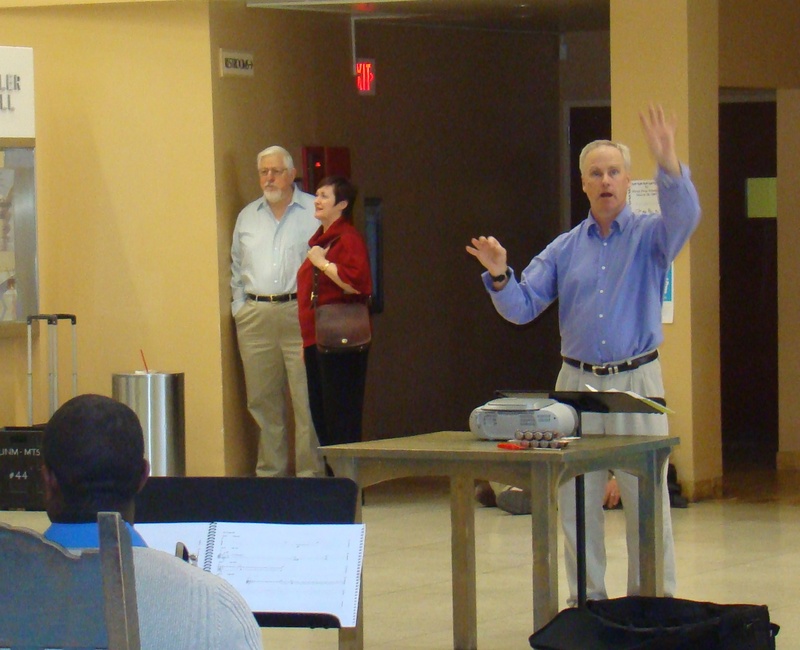 The score and parts are written in traditional musical notation and a conductor leads the piece. This version may be played with the short solo instrumental compositions played by instruments either within the ensemble or by other instruments (not necessarily strings). 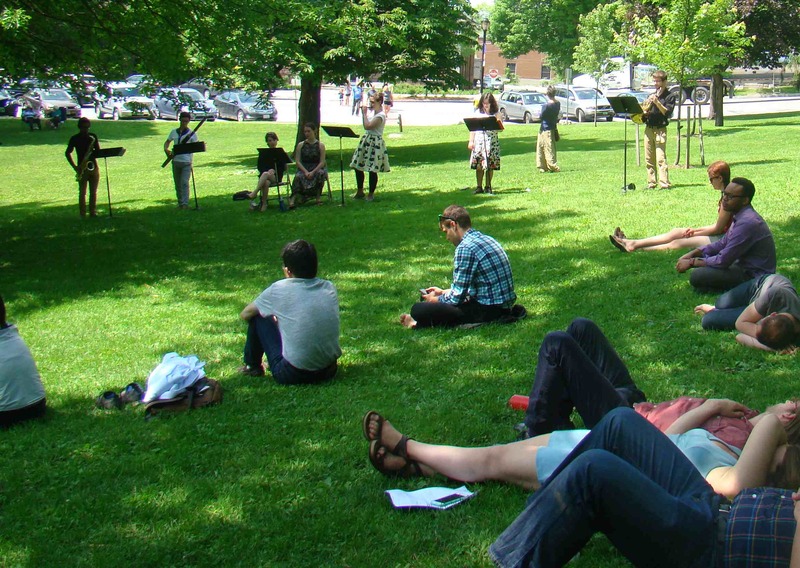 If instruments are involved in a performance of Arboretum, these only include the usual orchestral instruments: woodwinds (plus soprano and also saxophones), brass and strings. While the piece is not scored for keyboard or percussion instruments, they may be used as adjuncts to the instruments specified in the score (see below); in addition, the musicians will also be asked to produced various “noises” here and there in the piece; percussion instruments can be used for this purpose. In all of these types of performance programs should be passed out and someone may wish to verbally introduce the piece. The program should state that the audience need not stay fixed in one place but may move unobtrusively around the performance space. 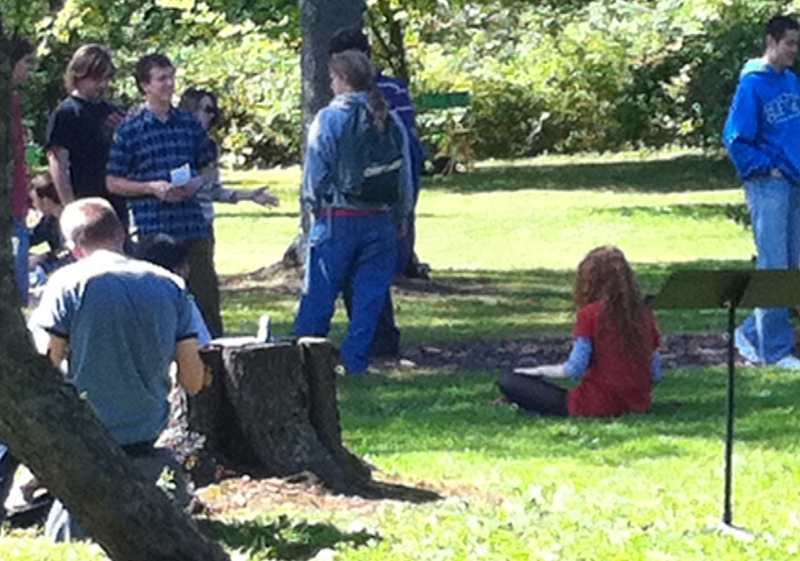 CDs of the computer generated sound version of Arboretum may be played outside in an inspiring and perhaps out of the way setting such as a canyon, deep woods, forest clearing, stream bank (providing there is not very much water sound). 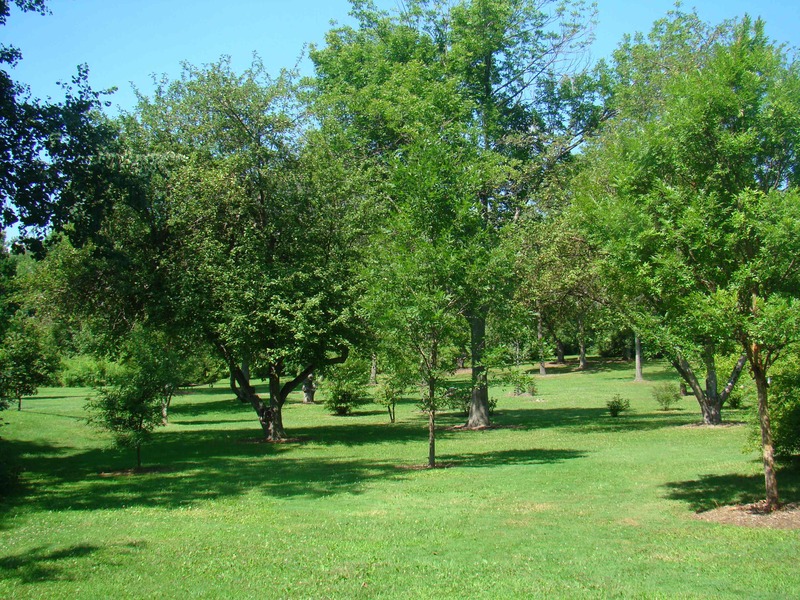 Other settings may include parks and gardens, but not places that are very busy or noisy. 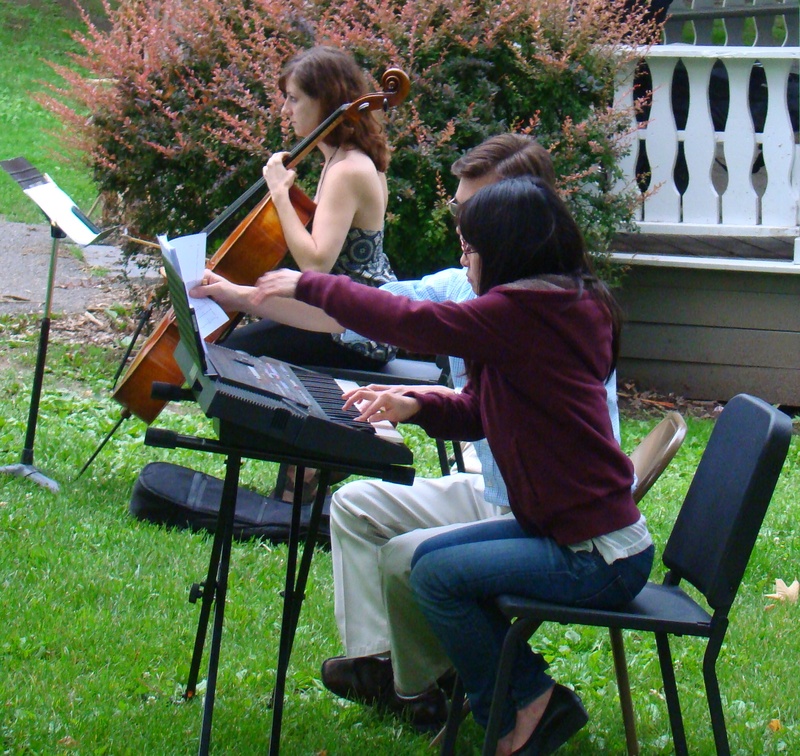 Arboretum may be announced as an outdoor “concert” or “event,” or the audience may be invited to the performance, or the performance may be unannounced and those that happen by may choose to listen to it. 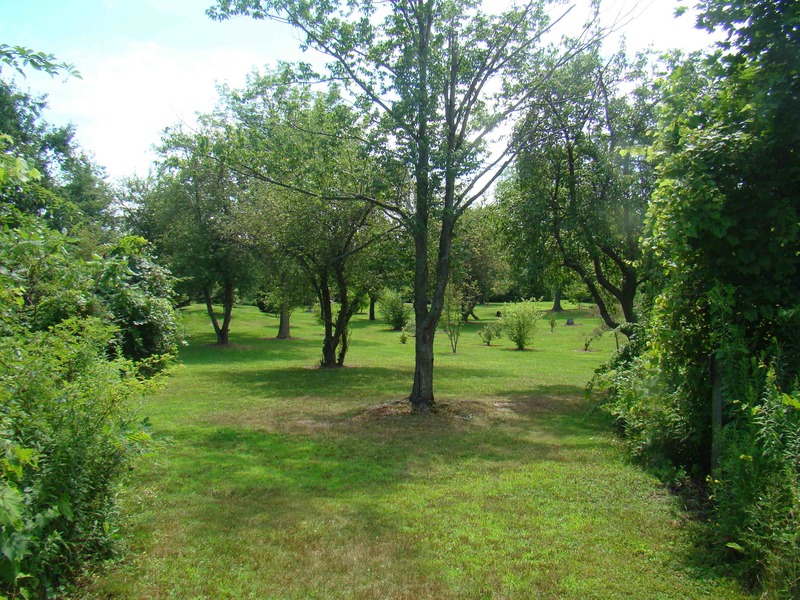 In a garden or park where there is electric current available, one may play the stereo CD on a sound system; with this sort of amplification an entire audience may hear the work. A more complex way is to use the performance CDs described below. There are six of these to be started at once distributed around the performance area. Again portable CD units will be used. 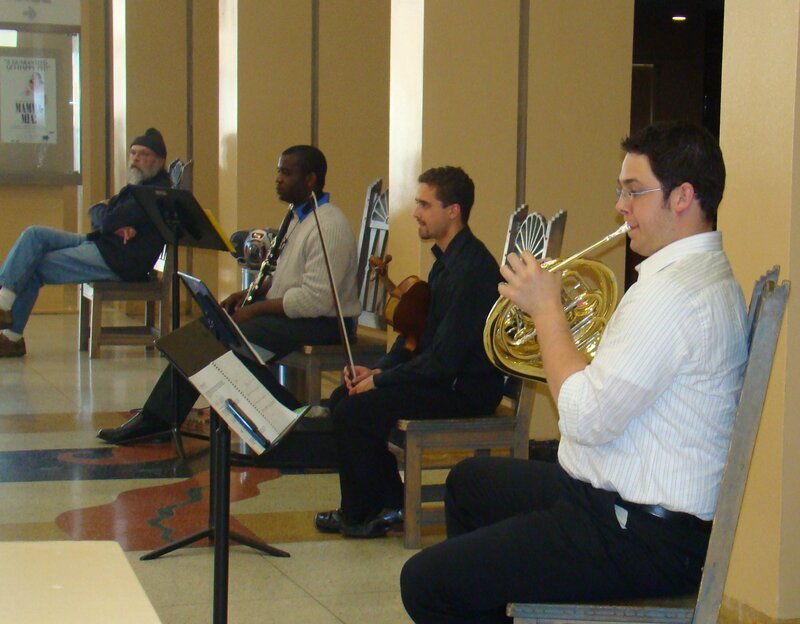 The concert hall or other type of indoor performance space with or without fixed chairs may be used for the indoor version. 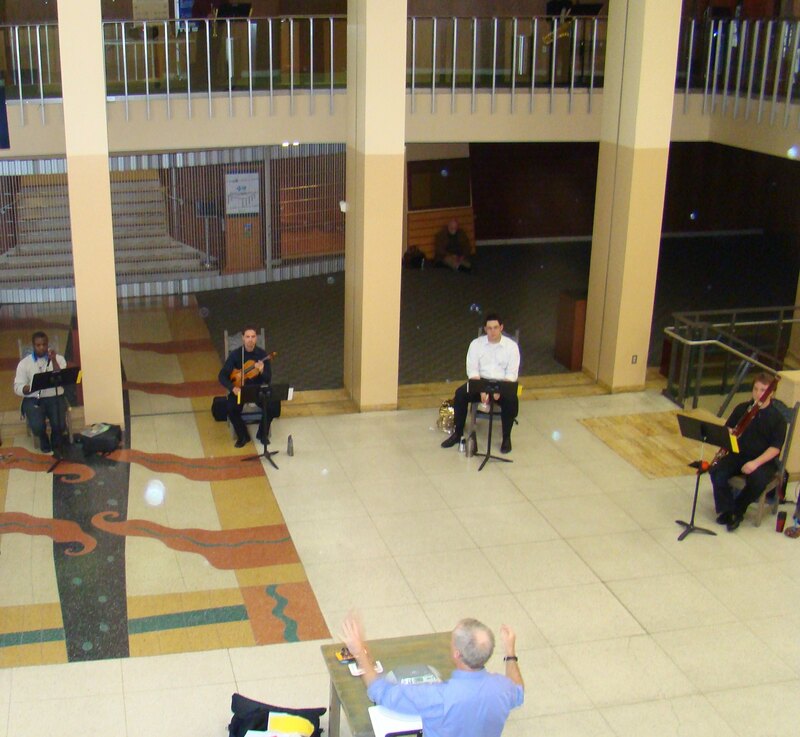 A traditional sound system of stereo amplification and speakers is used, (1) playing the stereo CD or (2) the six performance CDs (see below) emanating from speakers in six different locations around and possibly above the audience. 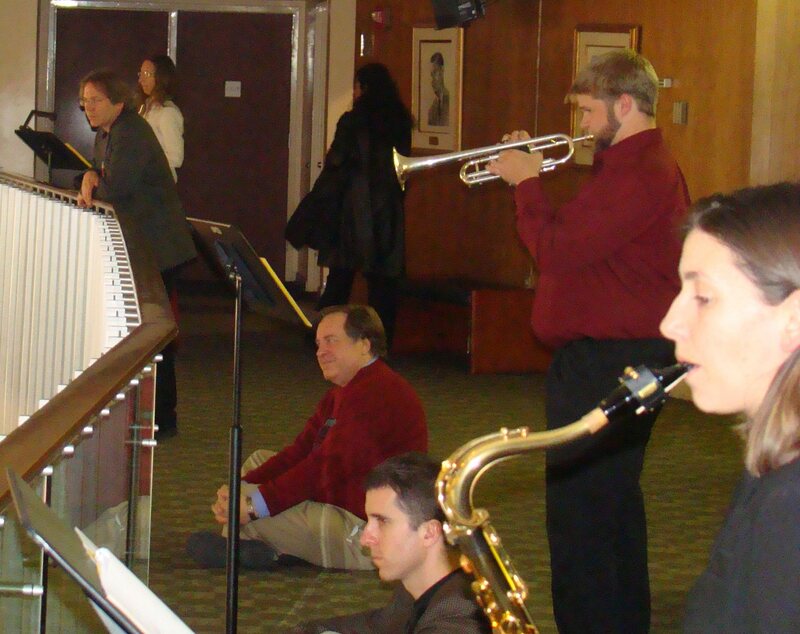 Jason Mills, piccolo; Heather Jennings, flute; Michael Abrams, clarinet; William Wordsworth, bassoon; Jennifer Macke, saxophone; Wesley Campbell, trumpet; Jay Austin, horn; John Skillman, trombone; Laura Eberhardt, Tuba; Rafael Videira, viola. 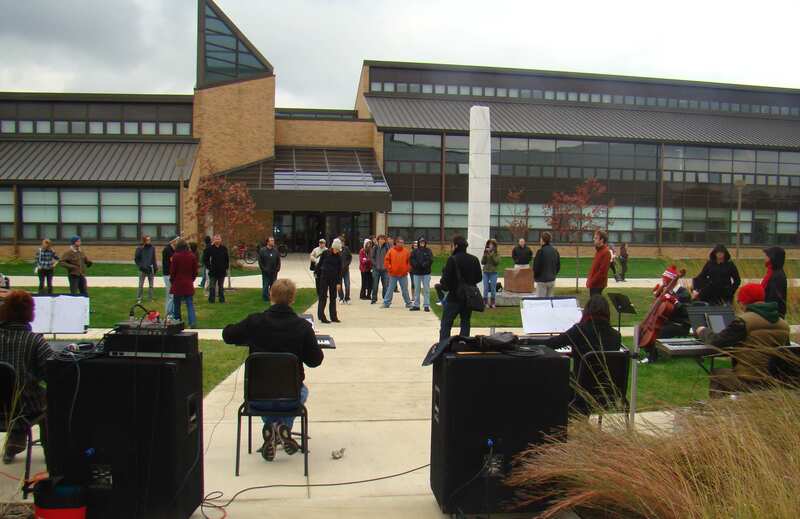 The first performance of Arboretum was to take place on April 2, 2009 in the Kiva Plaza on the University of New Mexico's campus. However, at the last moment, that performance had to called indoors, due to cold weather, rain, and wind. 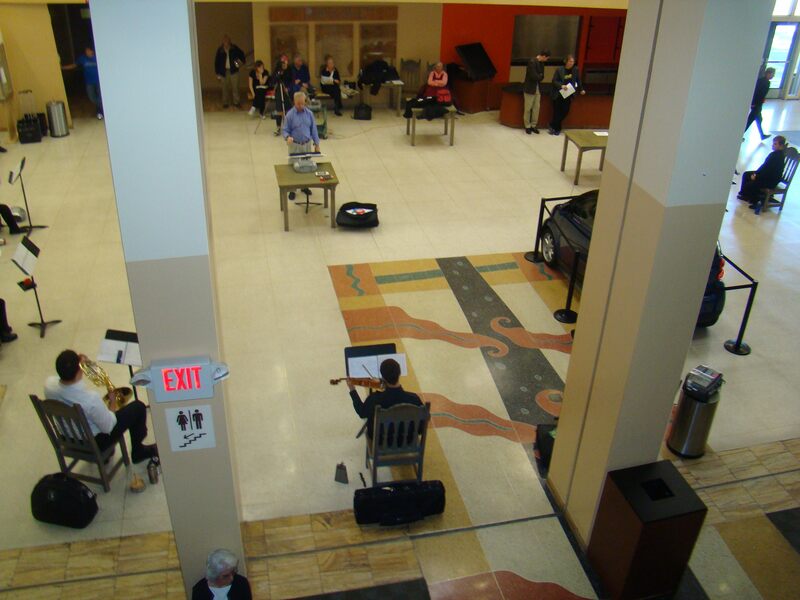 Here are some photographs of the indoor performance in the Center for the Arts Atrium of the University of New Mexico. Kate Lemmon and Heather Zinninger, flute; Sara Parulski, oboe; Anna Brumbaugh, clarinet; Julianne Schenck, bassoon; Diane Hunger, alto saxophone; Tyler Gauldin, tenor saxophone; Mirella Gable, french horn; Nikola Tomi, trumpet; Mike Blair, tuba; Haley Moore and Aaron Yarmel, violin; Melissa Claisse, viola; Dan Ketter and Julia Nilsen, cello; Ben Thomas, bass. 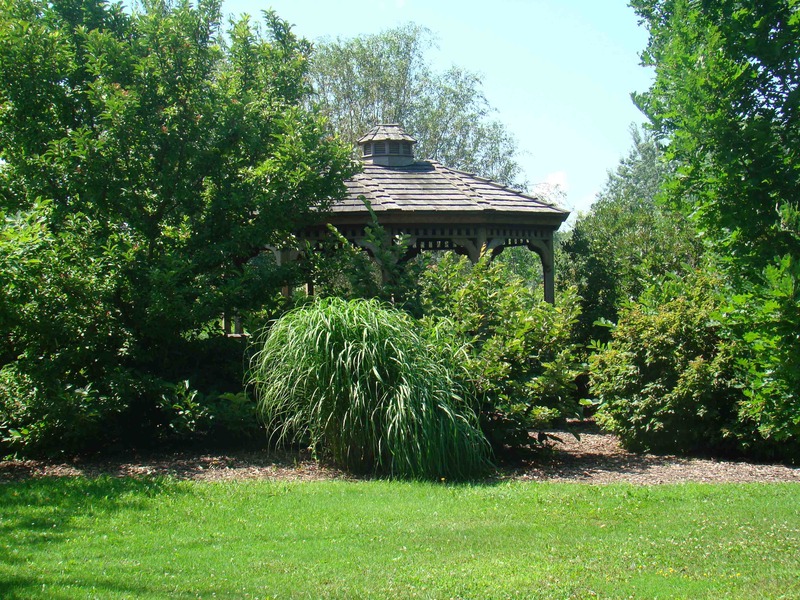 The Webster Arboretum is beautiful park of woodland trails, open meadows, flower gardens, two gazebos and a hedge maze. 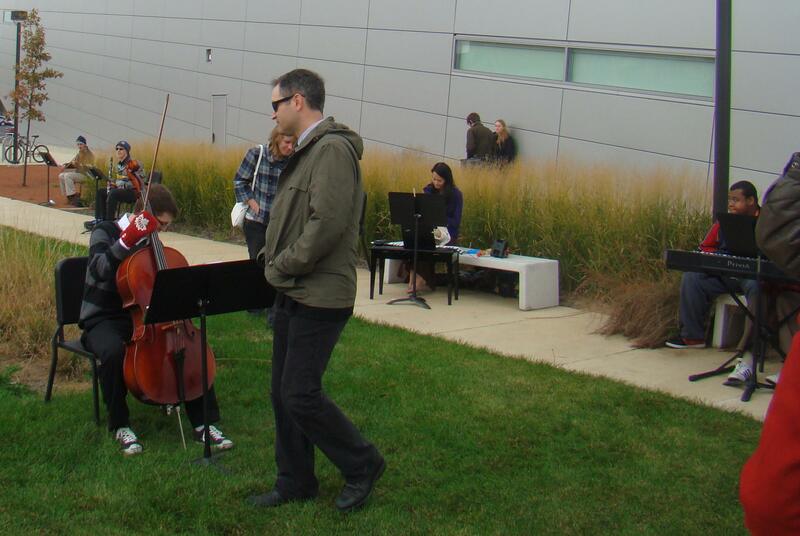 Arboretum was performed twice by OSSIA on Sunday, September 19, 2010 at 2 and 4 pm. A few photos of the performance and a sound bite of the second performance follow. 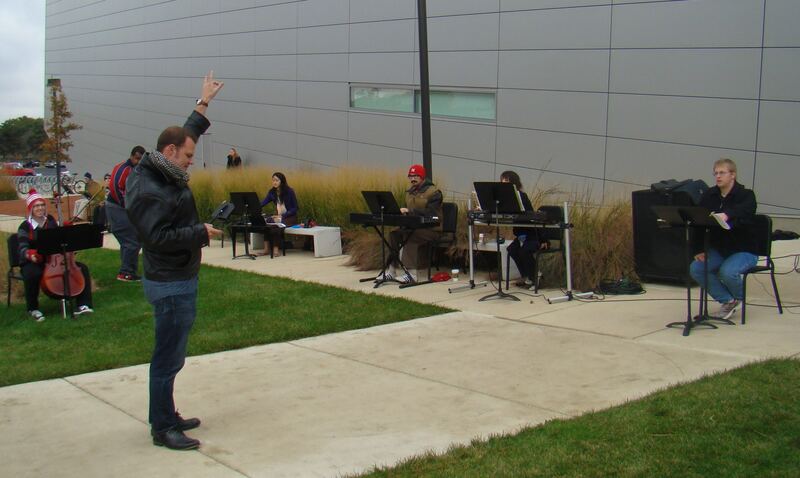 The piece was played at the Wolfe Center Outdoor Space at Bowling Green University on Saturday, October 30, 2012 at 1 pm—a cold, slightly damp, windy autumn day. Some of the players wore gloves. 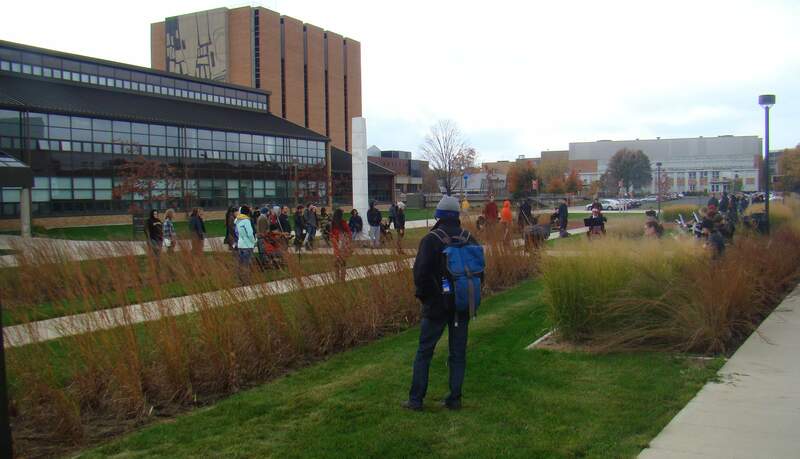 The audience was loyal and stayed to hear the entire piece, some briskly walking back and forth amid the performance space. From time to time Katarina Mojzisova danced with the ensemble. 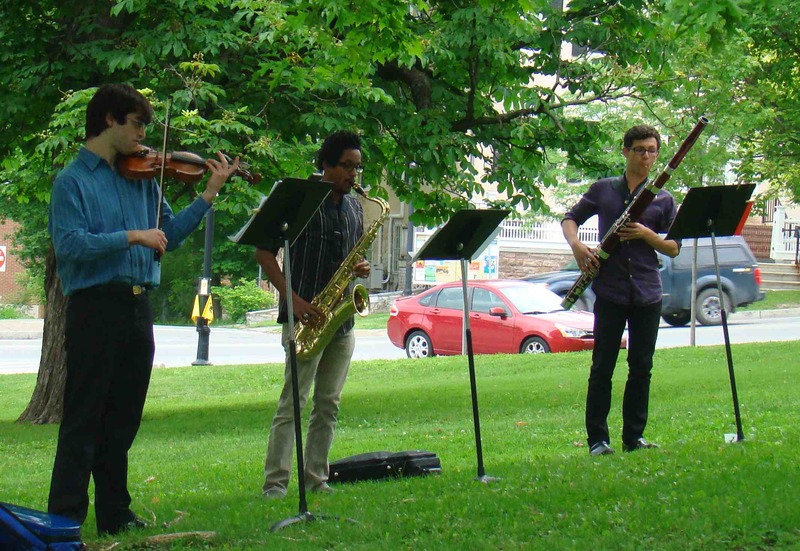 Arboretum was performed by the students attending the 2015 New Music on the Point new music festival on Friday June 12 (6:00pm) and Saturday June 13 (1pm)—the first performance was called off about 40 minutes into the piece due to rain.